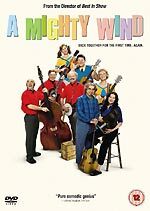 Warner Home Video will release A Mighty Wind on June the 14th! The mockumentary, which does to folk music what Spinal Tap did to rock music, will be available exclusively from HMV. (This is, of course, bad news for the consumer, because that means it won't be subject to competitive pricing from other retailers). The disc will, however, be available for rental at all the usual outlets. The disc will contain an audio commentary (by writer / director Christopher Guest and writer / actor Eugene Levy), fifteen additional scenes with optional commentary, the full live TV broadcast of the concert, hilarious TV appearances from the bands, Easter Eggs, a soundtrack promo and theatrical trailer. This seems to closely mirror the Region 1 version. The film will be presented in 2.35:1 anamorphic format, with Dolby Digital 5.1 audio. RRP is £15.99. I have a new review for you today, of Pathé's Region 2 Spun DVD. The film is about a sleazy crack addict who hangs out with his supplier, and his supplier's entourage, for a couple of days. It was directed by hotshot video director Jonas Ǻkerlund, and stars Rushmore's Jason Schwartzman, John Leguizamo and rising stars Mena Suvari and Brittany Murphy. It also features Mickey Rourke in a role that seems tailor made for him! The DVD is out on Monday. Click on the sleeve image, left, or here, to read the review. Columbia Tristar have scheduled their key titles for July. 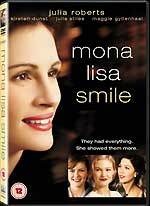 These are the Julia Roberts film Mona Lisa Smile, which is due on July the 12th, and the The Rock's bounty hunter action movie Welcome To The Jungle (a.k.a. The Rundown), which is due on the 26th. Columbia also seems to have pencilled in the second series of The Shield for the 16th of April. This is a Friday, though, so it's possible that this is a mistake. Still, at least it's finally being released on this side of the Atlantic. You can read a review of the R1 The Shield - The Complete First Season set by clicking here. I've received reports that the audio on the documentary on the new Texas Chainsaw Massacre DVD has been fixed for the discs that are now on sale, so I have updated the review. Warner Home Video is releasing two Ted Turner-produced epic Civil War mini-series on June the 28th: Gettysburg and Gods and Generals. 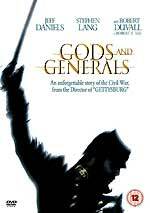 Gods and Generals will feature an introduction from Executive Producer Ted Turner, three behind-the-scenes documentaries (Journey To The Past, The Life of Thomas 'Stonewall' Jackson and The Authenticities of the Film) and two music videos (Cross The Green Mountain by Bob Dylan and Going Home by Mary Fahl). The full-length commentary track that appears on the Region 1 disc isn't mentioned on the press release, and has perhaps fallen victim, to the twenty - count 'em - sets of subtitles and the entirely superfluous German-language audio track. The series will be presented in 16:9 format, with Dolby Digital 5.1 audio. RRP is £15.99. 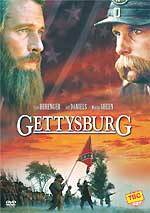 The 1993 production Gettysburg will be supported by a sporadic commentary track, by director Ronald F Maxwell, cinematographer Kees Van Osstrum, Pulitzer prize winning author James M McPherson and military historian Craig Symmonds. It will also contain the 1955 documentary The Battle of Gettysburg (30m, narrated by Leslie Nielsen); an interview gallery (featuring producer Ted Turner, director Ronald F Maxwell, stars Tom Berenger, Jeff Daniels, Sam Elliot, C Thomas Howell, Richard Jordan, Stephen Lang and Martin Sheen, and Civil War re-enactors), two featurettes (The Making of Gettysburg, 50m, narrated by Martin Sheen, and Maps of the Battlefield), TV spots and behind the scenes footage (presumably the same On Location footage as the US version). Gettysburg will be presented in 1.85:1 format (apparently not anamorphic, although the American version is), with Dolby Digital 5.1 audio (the US version is 5.0, so this may be a mistake). The RRP is £19.99. News of another Doctor Who DVD has leaked out (while other companies are starting to release information about June titles, BBC Worldwide haven't sent out a press release for May yet). The disc will feature the 1980 Tom Baker story The Leisure Hive, which saw the show return after a story had been abandoned half-way through because of strike action. The show had a new producer, renewed confidence, a more serious tone and much-improved production values. The story is one of the most impressive-looking in the series' history. It was shot differently from most Doctor Who stories (it was made using traditional one-camera methods, instead of the multi-camera techniques usually employed for drama shot on video), and, perhaps unsurprisingly, it went considerably over budget! The disc will feature a Dolby Digital 5.1 remix (composer Peter Howell's score is one of the series' best); an isolated score track and a commentary (by director Lovett Bickford, actress Lalla Ward and script editor Christopher Bidmead). The disc will also include several especially-produced featurettes: A New Beginning (including contributions from Tom Baker and behind-the-scenes footage); From Avalon To Argolis (interviews with the writer and script editor); Sythesisizing Starfields (a look at the creation of the series' new title sequence); and Leisure Wear (an interview with costume designer). 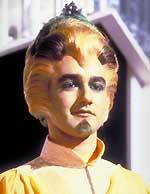 Other bonus items include a Blue Peter segment about the spring-cleaning of the Longleat Doctor Who exhibition. According to some of the retailers, the disc is being released in July the 5th. Universal is releasing the latest big-screen adaptation of J.M.Barrie's Peter Pan on April the 26th. 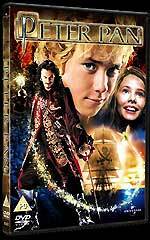 The film stars Jason Isaac as Captain Hook, and features Olivia Williams as Mrs Darling, Lynn Redgrave as Aunt Millicant, Richard Briers as Smee and Swimming Pool's Ludivine Sagnier as Tinkerbell. The disc will include an Alternate Ending and deleted scenes. Other bonus features are divided into sections, but there's no indication as to what these actually are: Neverland Forest (Tinker Bell - Behind The Fairy Dust; I Do Believe in Fairies), Black Castle (Enter The Castle; Learning to Fly (game? ); The Mermaid's Tale); Pirate's Ship (Board the Pirate Ship; Through The Eyes of Captain Hook; The Pirates vs The Lost Boys; The Lost Pirate Song), and Home Underground (Dig Under The Home; The Legacy of Pan; The Duchesses Outtakes; Lost Boys on the Set). If I get more details, I'll pass them on. The RRP is £19.99. Warner Home Video has re-scheduled the release of Visconti's The Damned for May the 24th. At some point the other two titles accompanying it, Death in Venice and Blow-Up, have been put back a week, to April the 19th. Amazon are offering the re-authored Blake's 7 - Season 1 DVD box set for £29.99. Here's a link. Tesco is running an Easter sale that includes a handful of classic British comedy titles, including Only Fools and Horses and The Best of the Royale Family. Check the list in the Offers page. Thanks to Zak Lovett for reporting these. Play.com have the two Carlton Sapphire and Steel box sets for £24.99 each at the moment. These are often available cheaper in HMV's sales, but this seems to be the best deal at the moment. Thanks to David Pope for spotting that. The RRP of the Battle of the Planets box set, due on April the 26th, has been confirmed as £89.99. If you can find a retailer still listing it with a price based on a lower RRP, let me know and I'll pass the information on. More details about Columbia's Fraggle Rock DVD, which is due on April the 5th, are now available. It's going to be a two-disc set! Disc one contains seven episodes: The Secret of Convincing John, Capture The Moon, Boober's Dream, Moley & The Minstrels, The Day The Music Died, Boober's Quiet Day and Invasion of the Toe Ticklers. Disc two contains five more episodes: A Friend in Need, Booberock, Red's Club, The Doomsday Soup and Junior Sells The Farm. The second disc will also include at Down At Fraggle Rock documentary. The Sea of Souls TV Series DVD has disappeared from Columbia Tristar's forthcoming schedule. Perhaps they've postponed it so that they can release it when the series comes back for a second season? Buena Vista is releasing the spectacularly unfunny Eddie Murphy vehicle The Haunted Mansion on DVD on June the 21st. The disc will feature a virtual tour of the Haunted Mansion ride (that the film is based on), outtakes and deleted scenes, a music video (Superstition by Raven), and Anatomy of a Scene featurette (Ghost in the Graveyard) and behind the scenes interviews. The disc will also feature a commentary track with producer Dan Hahn. If you haven't visited for a couple of days, you might want to read the review of Entertainment in Video's two-disc The Texas Chainsaw Massacre DVD, which is released today. The review disc had a significant flaw, which you should be aware of if you were thinking about picking up a copy. Hopefully by the end of the day we'll know whether the discs that reached retailer's shelves had the fault, or if it was corrected. You can read the review by clicking the sleeve image, left, or by clicking this link. Ceri is still away, so no update to the Incoming page today, I'm afraid. I'll have a bash at it later this week. I have gone through the Offers page, removing any offers that have expired, correcting the price on some of the ones that have changed (deleting the ones that no longer seem like bargains). A few bits and pieces have been added, so it's probably worth a look! If you spot any errors, or know about a bargain that's you think should be included, drop me an email.